The 20th Annual Paradise City Arts Festival opens to the public at the Three County Fairgrounds on Columbus Day Weekend, October 11, 12 & 13. 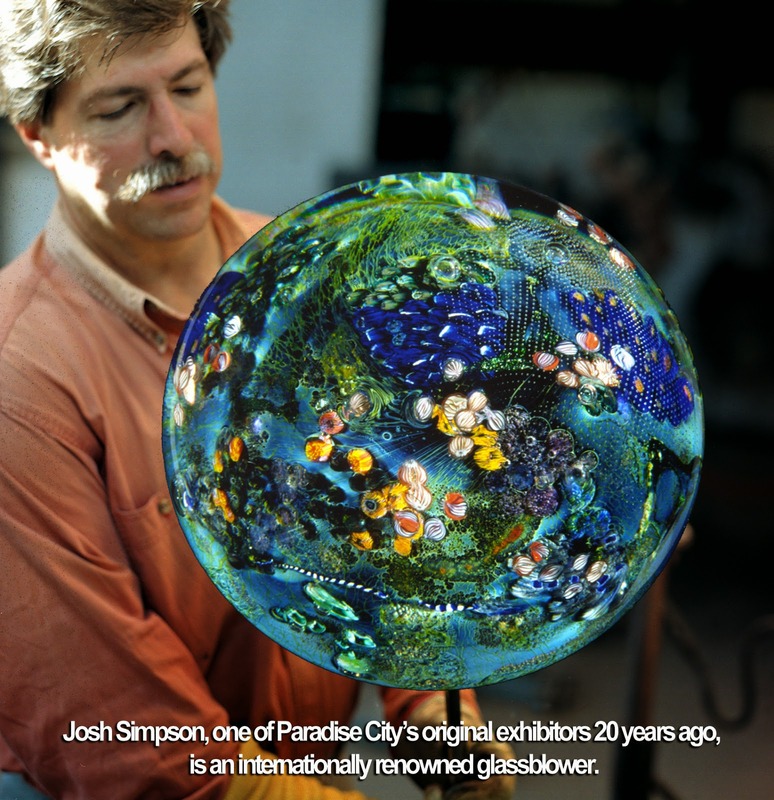 New England’s most exciting and comprehensive arts festival, Paradise City has won many national awards for the quality and diversity of its fine crafts, paintings and sculpture. Founded by two working artists, this event is a unique opportunity to experience an entire festival designed from an artist’s perspective. Held in four buildings and under tents, Paradise City is an experience like no other — beautiful, unique, festive and fun. This milestone event is the chance to meet face to face with 275 extraordinary artists traveling from every corner of the country, enjoy sensational cuisine by Northampton's best chefs and catch live performances by nationally and regionally acclaimed musicians. Stroll through a lush sculpture garden filled with artful delights and visit special exhibits, demonstrations and activities... all compelling reasons to come on down to Paradise City during the peak of New England’s fall foliage season. PBS provides multi-media ABC’s for kids, exciting entertainment for grown-ups such as Masterpiece Mystery and Downton Abbey, and fascinating scientific, political and cultural programming for all. WGBY Public Television for Western New England will receive 100% of the proceeds from the Festival’s Silent Art Auction, featuring hundreds of beautiful and valuable pieces donated by the Festival Artists. Glassblower Philip Jacobs literally plays with fire every day for his dramatic glassblowing demonstrations next to the Exhibition Building, while master potter and raconteur Tim Scull shares his skills on the potter’s wheel and the secrets of his studio in the Arena Building. The Fuller Craft Museum leads origami workshops, Alan Bennett teaches children how to sculpt imaginary creatures from clay, and at Big Wheel Press you can ignore the digital age and make your own notecards and coasters using two 100-year-old letterpresses and antique forms. “The food soars beyond expectations,” writes Boston Magazine. The Festival Dining Tent is a microcosm of Northampton’s vibrant restaurant scene, with recipes that span the globe. Expect lots of tasty surprises from the region’s restaurants at this fall’s show, using locally grown foods straight from the Valley’s farms. Sample exotic curries, pad thai, wood-fired pizza, fresh lobster and pulled pork sliders, dim sum, locavore burgers, overstuffed burritos, mango lassi, warm apple crisp and homemade ice cream. Restaurants include Local Burger, Sierra Grille, Spoleto, Amber Waves, India House, Pizzeria Paradiso, Bart’s Homemade Ice Cream, Mama Iguana’s and the Great Wall. Saturday: The O-Tones will embrace you with soulful jazz ballads and punch out fiery Motown and R&B. Sunday: Roger Salloom brings down the house with his award-winning original music, down-home blues and country rock. Columbus Day: The Art Steele Blues Band is a fixture in the New England blues scene, and Art himself is a poet, raconteur and philosopher. Cap off the holiday weekend with the passion of the blues!